August has quickly become home to my favorite type of genre, Metroidvania, each with their own distinct spin on the genre. From roguelikes to Souls-likes, the explorational platformer has seen its own rendition on those familiar tropes. Guacamelee! 2 takes a step back from that formula and just focuses on what makes a Metroid game so recognizable and approachable without any of that nonsense of level grinding and loot. A luchador still needs his upgrades, but who needs a giant sword or magical spells when you’ve got two fists and are full of beans? In the years since Juan last wore the mask, his status as luchador supreme has been downgraded to that of a loving father. Calaca’s no longer a threat and now the masked wrestler of Guacamelee! fame spends his days resting on his laurels at home. 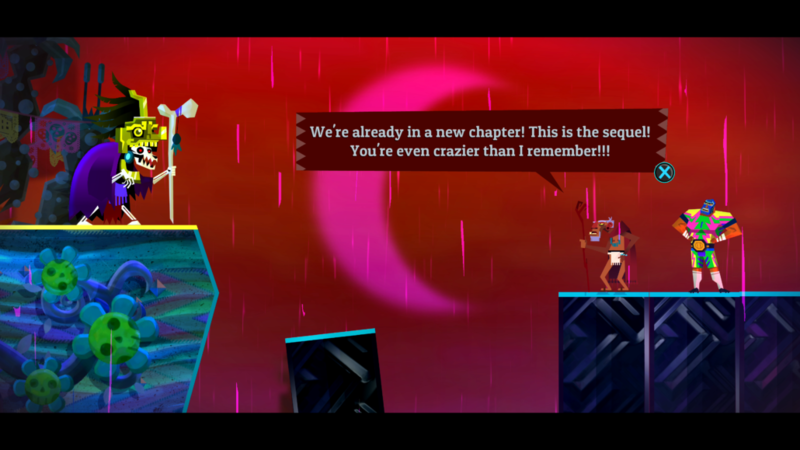 It isn’t long after the opening moments of Guacamelee! 2 that the comfortable life he’s earned is destroyed in an instant and he must once again put on the mask to save the day. Across all dimensions and timelines of the Mexiverse, trouble is cooking as a new antagonist aims to wreak havoc in search of the sacred guacamole and the ingredients/relics needed to craft it (It’s a mango; the secret ingredient is always mangoes). 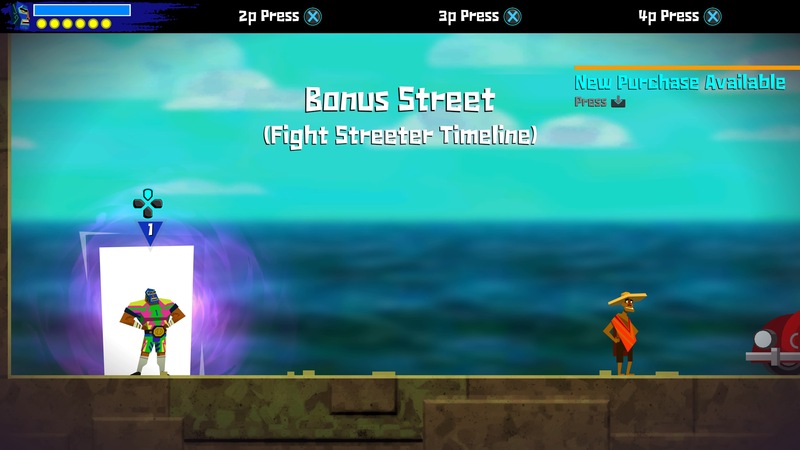 Much like the first title from Drinkbox Studios, Guacamelee! 2 blends together the stylish, fist-flying styles of a luchador wrestler with the platforming progression that Samus Aran has made her signature on the Metroid series. Every new move and upgrade helps with world traversal just as much as it adds a new tool into Juan’s arsenal. Frequently going off the beaten path and exploring the various corridors of each area can often lead to new health/stamina upgrades or a new cosmetic costume for Juan to don. Guacamelee! 2 retains the color-based upgrades that can elicit an immediate combat response. If an enemy tries to make a move on Juan while enveloped in a red shield, they can only initially be hurt by way of a flying uppercut. The same goes for other basic colors, each corresponding to a particular move. As Juan’s movelist grows, so too does his capability for unlocking new areas scattered throughout the Mexiverse. Soon, just like Juan’s adventures in the first Guacamelee!, he’ll be shifting through the dimensions of the living and the dead, soaring through the air as a combat-ready chicken, and bringing flying elbows and suplexes to all manner of baddie and beast. If you ever run into an area blocked off with a colored move that you have yet to unlock, chances are you’re going to be encouraged to return at a later date. All of those secrets and hidden paths are marked off on your minimap with their corresponding color, so knowing which areas still have secrets left to uncover are all presented incredibly well to the player. 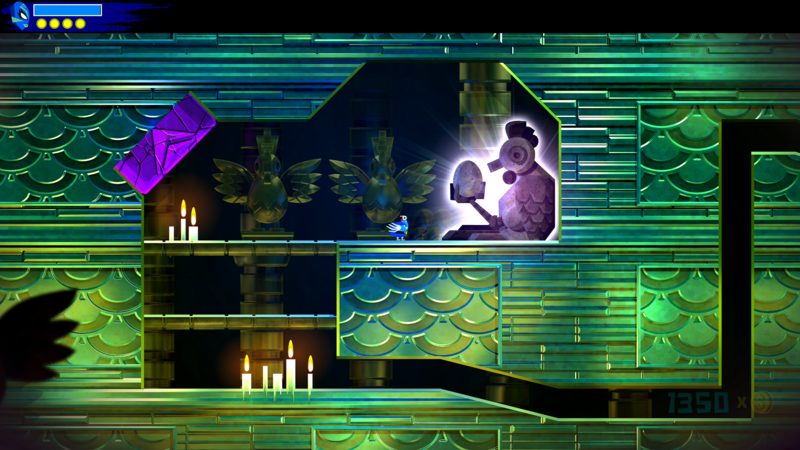 Some might say that it makes the Metroid part of the game more casual or simple, but with a game that’s as tightly packed with action and secrets in every area, I think a bit of visibility goes a long way in Guacamelee! 2’s favor. Just because you can see that there’s a secret room on the map doesn’t mean earning it is any easier. The Mexiverse is filled with challenge rooms of all sorts in Guacamelee! 2. Whether they’re combat challenges or those that require a certain finesse in traversal, there’s plenty of reason to return to previous areas and work towards those optional challenges. In the first Guacamelee!, I recall most of the platforming challenges being devilishly hard in one area in particular (The Tree Tops). Those platforming challenges are a bit more evenly spread out across the Mexiverse and are often not created equal. After all, the more abilities at Juan’s disposal, the more he’s expected to use them for these challenges. One, in particular, stumped me for a good twenty minutes as I had to swap between dimensions, uppercut, swap back, double jump, and transform into a chicken and glide across to the other side of the room all in one smooth combo. Whenever you pass these challenge rooms and unlock a new costume or health upgrade, there’s such a phenomenal sense of satisfaction quite unlike anything else in Guacamelee! 2. If you thought Drinkbox might tone down the memes in Guacamelee! 2, you’re in for a big surprise. The Mexiverse at large is littered with signposts and murals depicting all manner of meme that entered the modern culture since the first game. Some other jokes take the form of one-off gags in NPC conversation, but some of the more elaborate jokes play with the Metroid medium to great effect. Across the Grindiest Timeline, Juan’s adventure melds into the role of turn-based JRPG combat in a brief gag that doesn’t outstay its welcome (unlike the similar attempt in SUDA51’s The 25th Ward that goes on a bit too long). 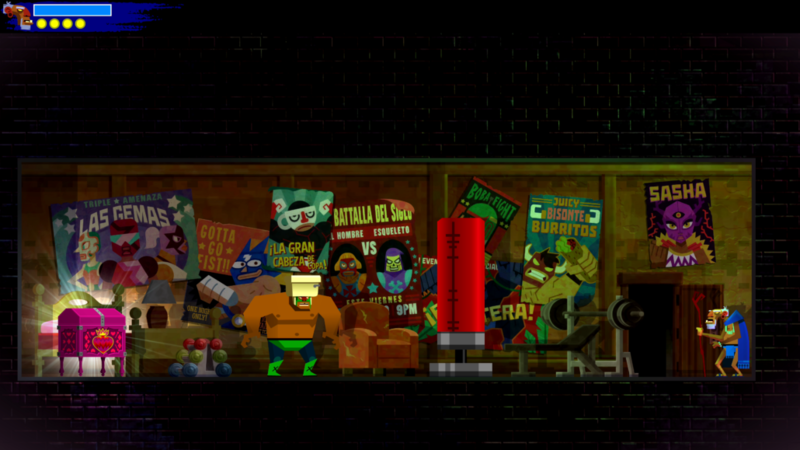 Much of the internet humor is front and center in Guacamelee! 2, so you can’t fully escape sight gags or references that might go over the average player’s head. With the multiple timeline trope of the Mexiverse, there’s plenty of opportunity for Guacamelee! 2 to play around in the medium and drop in a gag or two to lighten the mood. While not a required way to play, Guacamelee! 2 offers to drop-in/drop-out multiplayer that was first implemented in the eloquently named Guacamelee! Super Turbo Championship Edition and Gold Edition. If you want to brawl your way through the Mexiverse with friends, the option is there right from the beginning and the game feels nicely tuned to accommodate the additional players. You won’t be limited to just Juan and Tostada either, as new character skins and costumes will be available both from the journey’s beginning and locked away in treasure chests hidden throughout the land. These characters don’t actually differ mechanically, but the various costumes (which Juan can also don in single player) give a bit of extra flair to the adventure. Guacamelee! 2 plays it pretty close to the strengths of the previous game: combat-filled corridors that encourage exploration with every new upgrade, melee combat that flows and combos incredibly well and memes that may or may not stand the test of time. With all of this and a touch of lime and mango, you’ve got the recipe for another tasty bowl of guacamole. Better yet, share it with friends and make a night out of Guacamelee! 2. Memes. The DNA of the soul.